Will Cooper has been so focused on raising his daughter, Sophie, hes lost sight of who he is as a man and has headed deep into the parental vortex. 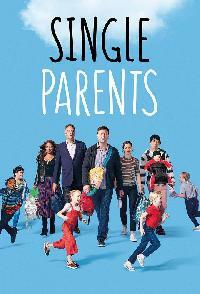 When the other single parents - Angie, Douglas, Poppy and Jake - at his daughters school see just how far down the rabbit hole of PTA, parenting and princesses Will has gone, they band together to get him out in the world and make him realize that being a great parent doesnt mean sacrificing everything about your own identity. Douglas is stuck hosting the kids Saturday sleepover, and Will uses this as an opportunity to try to bond with Douglas, something he hasnt been able to do before. Angie and Graham both struggle with their own fear of sleepovers Graham is worried to stay the night without his mom and not in his own house, and Angie is worried to sleep over with her man friend Owen. Meanwhile, Poppy helps Miggy come up with potential job ideas in order to help him become more responsible. Episode 3 "A Leash Is Not A Guinea Pig"
After seeing the way Douglas and the twins are barely affected by the death of their guinea pig, Pickle, Poppy encourages Douglas to stop repressing his and the twins feelings. After seeing how close Graham and Will are becoming, Angie gets jealous when Graham asks Will to go get a colonoscopy to check on his health, so Angie decides to get one herself. Episode 4 "Beyonc Circa Lemonade"
After scolding Miggy for not being able to sleep-train baby Jack, Angie and Douglas engage in a competition to see who can sleep-train the baby in one night. While Angie and Douglas have the baby, Miggy takes over babysitting Graham, Rory, Sophie, Emma and Amy, which results in an impromptu kids party. Meanwhile, Poppy teaches Will how to take out his anger on the volleyball court. Episode 5 "Politician, Freemason, Scientist, Humorist and Diplomat, Ben Franklin"
Will is crushed when Sophie wants to tone down Halloween and invites a boy over. Poppy and the twins attempt to convince a reluctant Douglas to wear a silly costume; after he finally puts it on, he meets the woman of his dreams, who he now is sure will not take him seriously. Meanwhile, Angie struggles to tell her boss that she needs to leave work to be with her son on Halloween, leaving Grahams costume in limbo. Will hits it off with Angie and Grahams pediatrician, Dr. Dewan, but Angie worries hell ruin Grahams chances of getting on the Mist List for the flu vaccine. Miggy tries to help Will navigate how to handle his situation with Dr. Dewan by giving dating advice. Meanwhile, Douglas gets sick, and while delirious with a fever, he accidentally reveals to Rory that he likes Poppy. Episode 7 "They Call Me DOCTOR Biscuits!" When Graham and Rory are cast in their schools production of Grease, with Graham as the lead and Rory with a lesser known part, Poppy and Angie get involved and try to appeal to the drama teacher, Dr. Biscuits, to make changes. Meanwhile, Will is not ready to tell Sophie that hes seeing Dr. Dewan, so against his better judgment, he takes Douglas advice and lies to Sophie. Episode 9 "Ronald Reagans White House Collectible Pen"
Will is thrilled to throw the first-grade parent social so that he can use this event to springboard his anti-smartphone platform to get parents to wait to buy their kids cellphones until eighth grade. He ropes his new love interest, Dr. Dewan, into helping him, but his plan doesnt work out quite like he had hoped. Douglas offers to have the social at his house so he can exact revenge on his rival dermatologist, Mark, whom Douglas is convinced stole his prized pen. Episode 10 "The Magic Box"
Episode 11 "That Elusive Zazz"
Will decides to audition for his dream job as an on-camera weatherman, but in order to succeed, he needs a little help from Miggy, Poppy and Sophie to hone in on the perfect persona. Meanwhile, after Angie discovers that Graham has the word FARTS written on his forehead in permanent marker, she goes on a mission to obtain an apology from the responsible parties Emma and Amy and unfortunately Douglas does not provide much help. Episode 12 "All Aboard The Two-Parent Struggle Bus"
When Wills ex, Mia, shows up unexpectedly for Sophies birthday, Will gets frustrated that she undermines his rules with Sophie. Angie tries to help Will cope by having a fun girls night at her place and by giving some co-parenting advice, but Poppy reveals and Will quickly learns that Angie isnt the best advice giver. Meanwhile, inspired by Mias humanitarian work, Miggy and Graham decide to give some items to charity but regret it immediately and seek out help from Douglas to get the items back. Episode 13 "Graham DAmato: Hot Lunch Mentalist"
Will wants to get back together with Mia, but as their relationship progresses, he finds himself having to choose between the normal family hes always wanted and the new family hes created with Angie, Poppy, Miggy, Douglas and the kids. In order to get Will to come back to his senses about Mia, Angie kicks him off thea babysitting grid and fills the spot with Dr. Mark, Douglas rival dermatologist, much to Douglas chagrin. Meanwhile, Graham is nervous to compete in the talent show and relies on Will to calm him down when he gets nervous on stage. Douglas discovers that Amy is a math genius and is overwhelmed with how much time he has to spend to treat his daughters as individuals for the first time ever; this eventually leads to Emma moving into their private shed to get some space from Amy. Meanwhile, Graham makes a new friend at school, causing Angie to have to spend time with his new friends mom, Nora, to Angies chagrin. After Angie meets Nora in person and enjoys spending time with her, Poppy starts to grow jealous of Angies newfound friendship. Episode 15 "A Cash-Grab Cooked Up By the Crepe Paper Industry"
Douglas agrees to babysit the kids on Valentines Day, but when Graham finds himself in a Valentines Day emergency and Big Red shows up unannounced, Douglas and Big Red band together to help Graham. Meanwhile, Will and Miggy celebrate Palentines Day together a day honoring the love of two friends but when they run into Angie at her second job, they help her finish her deliveries so she can be with Owen on Valentines Day. Episode 16 "John Freakin Stamos"
When Poppys ex-husband, Ron, gets serious with his latest girlfriend, Poppy has to deal with the reality of another woman helping to raise her kid. The secret gets out that Sophie has a crush on Graham, which causes a stir not only in the first-grade classroom, but also between Angie and Will. Meanwhile, Miggy gets cold feet after asking Douglas to remove his tattoo of Zaras initials, and Douglas has to help him realize that his relationship with Zara is officially over. Episode 17 "Summer of Miggy"
Seeing that baby Jack is about to walk for the first time, Miggy feels old and tries to recapture his youth by throwing an epic party. When the party doesnt go as expected, he insists that Poppy and Douglas stick around to help him. Angies boyfriend, Owen, meets Graham for the first time, which doesnt go as well as they had hoped. When Will gets an opportunity to do the weather at 10:00 p.m., Rory tags along and causes drama on the set. Episode 18 "A Radiant Cloak of Sexual Irresistibility"
Episode 19 "Win a Lunch with KZOPs Will Cooper! "